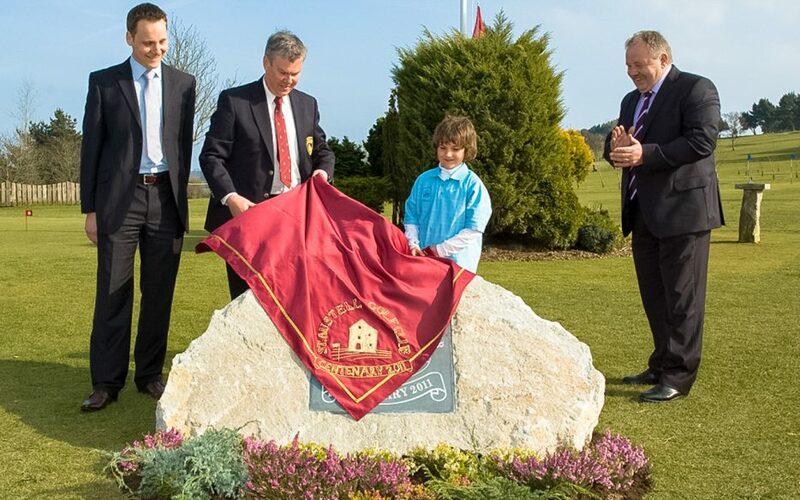 To mark the start of St Austell Golf Club’s Centenary Year, the Centenary Stone was unveiled on Saturday, 19 March. This magnificent rock was inscribed and kindly presented by china clay company Imerys. Representing them at the unveiling was club member Ross Facey, together with John Treglown, from club sponsors St Austell Brewery, and Glyn Rowett, Centenary Year Captain. Ewan Warren, the youngest member of the club, assisted them. 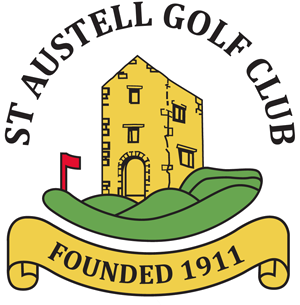 Dan Olver, winner of the Saturday MedalIn May Cornwall Golf Union’s Amateur Championship Meeting was held for the very first time at St Austell. The first Championship was in 1896, and for many years it was held predominantly at the five courses: St Enodoc, Trevose, Newquay, Tehidy and West Cornwall. In 1974 Carlyon Bay was added to the rota, and since then other courses have been included. Centenary Year Club Champion, Simon Harper reached the Championship semi-final, losing 3 and 1 to eventual winner, Tom Fox, of China Fleet. Captains Day’Glyn Rowett celebrated his Captain’s Day in July by introducing “Power Golf” for the competition. This involved two flags on chosen greens with bonus points for the harder pin placements. Centenary ScoreboardThe final day of Golf Week in August saw the reintroduction of a very successful Pro-Am Competition that had been dropped in 2005. This was supported by a number of local amateurs and professionals from a variety of clubs across Devon and Cornwall. It was also a memorable day for Paul Hendriksen, who broke the Club’s professional course record with a round of 63. A ‘Timewarp’ weekend, with players using hickory-shafted clubs and dressed in appropriate garb.Golf Week was followed by an extraordinary week in which we played the Old Course that James Braid laid out in the 1920s. The greens staff had been preparing the four old greens we were to play for several months and Simon Harper went out first thing on the Monday to post directions and move the flags. Competitions were played each day, culminating in a ‘Timewarp’ weekend, with players using hickory-shafted clubs and dressed in appropriate garb. Sunday Mixed FoursThe Centenary Ball was held on Saturday evening with full evening dress. Sunday’s competition was for the Mixed Fours who also threw themselves into the spirit of the occasion with some lovely period outfits. The weather was kind and everyone enjoyed a wonderful day. In October the Mackerel Match was revived for Centenary Year not having been played for several years. It used to be an all-day match play event between four teams: St Austell, Par, Mevagissey and The Rest. Joey, the stuffed mackerelThe winning team treated to a free mackerel supper by the losing teams with the trophy, Joey, a stuffed mackerel, mounted on the winner’s wall of the Club House for the following year. On this occasion an abbreviated version of the old match was played and Imreys Mid-Cornwall Male Choir sang splendidly for us in the Club House after the Match. Just before Christmas, as a culmination of a wonderful Centenary Year, the book to commemorate 100 years of golf at St Austell was launched by the Captain Glyn Rowett. Present also (pictured right) were President Barry Ross with the Club’s Historian, Gary Harper, Editor, John Smith and Designer, Sue Smith.